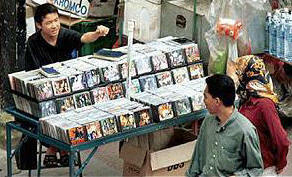 Pirated CDs and DVDs account for most of China's music and films sales. Music piracy is worth an estimated 514 million euros every year in China, and Irish artists such as U2 and Enya are among those most pirated, losing millions of euros every year to a massive illicit trade. Every month the spectacle returns, big steam-rollers crunching slowly forward in setpiece shows of CD and DVD crushing. TV cameras, reporters and photographers are all pressed into the effort, China's way of showing the world it's serious about living up to World Trade Organsation (WTO) membership commitments. The display of toughness by Beijing is having dubious effect however. Traders in areas of the city frequented by foreigners ply their trade discreetly, standing on street corners to whisper "CD?, DVD?" to passing westerners. On most of Beijing's back streets however there's at least one large shop selling pirated CDs and DVDs, with little if any legitimate stock on the shelves. In areas with large student populations, such as the north western university district, Haidian, such shops multiply in number and even stock relatively rare indie films and music. Global pop stars like Madonna and Mariah Carey are among the most pirated artists. Irish artists are particularly popular with Chinese audiences: shops selling counterfeit products consistently stock U2, Enya, the Cranberries and Westlife. I've also discovered the Chieftains and Mary Black in several outlets. Chinese music tastes tend to favour softer styles and so Enya has a huge following among all age groups. Only Yanni, Kenny G and The Carpenters can compete. Asian stars suffer too: The huge Hong Kong Canto-pop industry, and the Taiwanese centred Mando-pop scene are both feeling the pinch from mass counterfeit sales. Boy band F4 and Jay Chou Jie-lun, so-called "King of Mando-R&B" are two of the pirate industry's most reliable sellers. Fluffy-sweet and clean cut, F4 are a Westlife-style creation devised by producers to boost falling music sales and re-coup some of the revenue being lost to piracy and competing entertainment industries such as video games and reality TV. Bubblegum pop band F4 represents a new tool among record corporations seeking to regain profits in Asia. The band members' fresh-faced good looks have been packaged into a series of CDs, TV soap operas, variety shows, and online video games. Boy band 5566 meanwhile has its own cable television drama, MVP Lover. Other formerly high earning Chinese pop stars rely on endorsements and acting to supplement diminishing album royalties. The safe-playing attitude of record companies has meant that original but more adventurous acts are enjoying much less record company attention. More than 90 percent of Chinese music sales, according to the International Federation of the Phonographic Industry (IFPI), take the form of bootlegs. The IFPI puts the values of such sales at more than $530m. A recent letter from a music fan to the Shanghai Star sheds more light on why pirated music and films sell so well in China. Titled "Why I buy pirated CDs Only" Yi Nanping wrote "I am addicted to searching for CDs, VCDs and DVDs in whatever places I can find them. I prefer combing small streets around the city and spotting some private stores or simply streetside stands that may not be attractive yet sell my favourite disks. I believe that is the only choice for me for the time being, because my wallet is still not thick enough, and only pirated editions are within my budget." Admitting that he also knows "the dark side" to pirate disks ("...they mean an open contempt for copyright") the writer explained that he chose pirated disks because he couldn't afford the legitimate alternatives. "I made a simple calculation that I am expected to pay 120 yuan [13 euros] more for an authorized CD if I say no to the pirate version. And I believe most people in China, including many expatriates, are also more than smart enough to understand that calculation." The majority of shops selling CDs and DVDs in Beijing and other Chinese cities sell pirated products. They do so openly and pay their rents and taxes the same as any other retailer. A copy of U2's Elevation album costs 10 Yuan (1.50 euros) in city centre shops selling pirated goods. The same album costs between 65 and 80 Yuan at a Xinhua bookstore, China's chain of large-size bookshops, a local equivalent to Eason's in Ireland. The packaging and quality of the goods tends to be much better than most European equivalents. Liner notes and elaborate packaging are included in cds, the only hint as to their origin being the faulty spelling on most title lists. A source of tax revenues for the government, it appears that the harm caused by counterfeit CD and DVD shops isn't fully appreciated by China's policy makers. Pirated CDs sell in China because the genuine article is too expensive for most local music fans. "If the prices can be lowered significantly, then there's no need for a pirated goods market" suggests Ni Yanping. "Maybe that gives us another good reason to look forward to China's entry into the World Trade Organization, which is expected to bring us more affordable and copyrighted audio and video products." Irish woman Sile O'Broin, former communication officer for the Quality Brands Protection Committee, a coalition of 83 multinationals engaged in anti-counterfeiting in China. "China is doing a lot but needs to do much more on trademark protection and cracking down on counterfeit, fake, and shoddy goods" said O'Broin, who also served as public relations and liaison officer to the EU-China Intellectual Property Rights Cooperation Programme. The EU has contributed significant funds towards raising awareness in China of the consequences of piracy. Record companies in the Chinese market have seen revenues fall to twenty five percent of their 1998 income levels. Production budgets have been slashed at least 50%. Several international record companies present in China have cut the prices of some outdated yet original products to regain their lost market. Piracy is only part of the problem however, according to Simon Ho, general manager for MTV Taiwan. More demanding consumers are distracted by the Internet and the video-gaming industry. "Now, music is no longer a necessity. The youth today have so many options; they change their tastes and preferences constantly." Headlines recently on Chinese televisions news shows suggested the crack-down was picking up pace. Authorities in Wuhan, in central China's Hubei Province closed down a local electronic product wholesale market, believed to be China's largest distributing centre of audio and video products. "State authorities have announced that a nationwide campaign is to be launched soon against shops selling pirated audio and video products"
Psychology student Pen Yuan Yuan supports the government effort but isn't particularly worried as she shops for pirate DVDs an VCDs at a shop near Beijing's Renmin University. "I totally support such a great campaign... but it seems like an annual routine that may not be so effective. "Dying cinders may glow again" is a Chinese expression. So even if some stores are closed, many others will appear because there's such a demand. Maybe if the Government is really strict and the fines really severe then it will work." Check our Mark's feature on the Chinese rock scene.